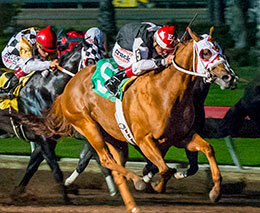 One Sweet Racy, under jockey Edwardo Nicasio, drives to victory in the Grade 1 $100,000 AQHA Distaff Challenge Championship Sunday night at Los Alamitos Race Course. LOS ALAMITOS, CA—DECEMBER 2, 2018—Johnny Trotter's One Sweet Racy took the lead shortly after the start and then held off a game effort by Hayden Brothers Ranch's Tickle Ur Fancy to win the Grade 1, $100,000 AQHA Distaff Challenge Championship on Sunday at Los Alamitos. Ridden by Eduardo Nicasio for trainer Chris O'Dell, One Sweet Racy was fourth out of the gate, but quickly found her stride to clear the field by a half-length with 110 yards left in the race. Tickle Ur Fancy was moving like a bullet by then and almost won the race at the wire. 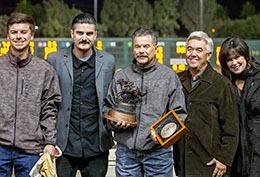 The winning connections of One Sweet Racy accept the AQHA Distaff Challenge Championship trophy Sunday night at Los Alamitos Race Course for owner Johnny Trotter. Sent off as the 3-5 favorite, One Sweet Racy held on to win by a nose, while covering the 400 yards in :19.872. The 4-year-old mare by One Sweet Jess has been outstanding since arriving to O'Dell's barn in the summer. She's won three of her four local starts this year with her only loss being a runner-up effort in the Grade 1 Mildred Vessels Memorial Handicap. 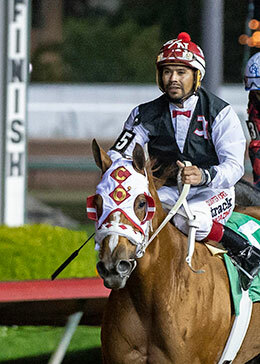 In her first two starts at Los Alamitos this year, One Sweet Racy won the AQHA California Distaff Challenge Championship and scored a daylight allowance win early July. The AQHA Distaff Championship was originally scheduled to run on November 17 as part of Bank of America Challenge Championship Night. However, there was a gate malfunction before the start of the race that affected several horses in the race and as a result the racing stewards declared the race a "no-contest." The race was rescheduled for tonight and all 10 mares re-entered the race. One Hot Habit was scratched from the race on Sunday night. One Sweet Racy was one of the horses affected on November 17, but fortunately for her connections it was something that she was able to quickly overcome. "When the gate malfunction she broke thru the gate and she grabbed a quarter," O'Dell explained. "We had to patch that up a little bit and work on it. That put us a little bit behind, but everyone was pretty much on the same boat, everyone had their own problems and things to deal with after that night. She grabbed a spot and tore a little bit of skin off. Fortunately it wasn't a huge deal and we were able to take care of it. "Eduardo said she got a little bit tired right at the very end. (Tickle Your Fancy) ran a great race. She was one of better horses in the race and ran a great race. She was running at us. I was glad to see that everyone had a nice, clear shot. That's what I wanted to see. It looked like it was a good, clean race. That's what we like. What a great mare. We are so thankful that Johnny Trotter sent her out here. It means a lot to me to win a race like this for him. He sent her out here for these kind of races. I think our plan is to race her in the Charger Bar Handicap next." Bred by Sunflower Supply Co., One Sweet Racy earned $46,000 for the win to take her career earnings to $370,423. She's now won four of 17 career starts. She finished second to champion Hold Air Hostage in last year's Grade 1 All American Derby. Vicente Treyes' Coronas Fast Dash fill Duck Dash N Go earned $10,000 for running third for trainer Monty Arrossa and jockey Jose Nicasio. Glen Ellyn, Kono, Gold Diggin Queen, Corona Springs, Mary Paintyourwagon, and Dahteste followed the top three finishers across the wire. In addition to One Sweet Racy, trainer Chris O'Dell will point multiple stakes winner Thermonuclear Energy to the Grade 1 Charger Bar Handicap on January 6. Another one of his trainees – the graded stakes winner A Political Lady – could also see action in the Charger Bar, but first she'll race in the Southern California Derby final on Friday, December 13.